Last summer was, to coin a phrase, rubbish really. Plenty of rain but very little sunshine - but still hot/muggy weather. This has presented a challenge to those of us who enjoy being outside to stay both dry but not turn into boil-in-the-bag meals whilst doing so in assorted waterproofs. May I present to you the Waterproof Breathable Jacket - part of Highlander's Pro-Force range. 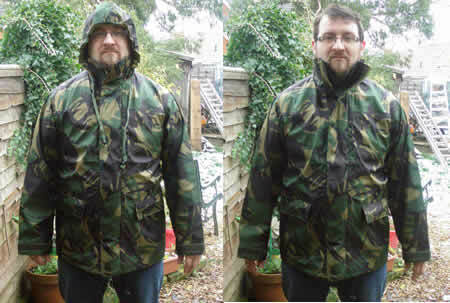 The jacket I was sent to review came in British DPM camouflage which is well known to most outdoor enthusiasts, and when I compared it to the assorted army surplus items I own there is no visible difference between the two in the quality of the DPM - which stands for disruptive pattern material for those of you who were unaware. The waterproof breathable jacket has two zipped pockets with storm flaps which is a marked improvement over the British Army Gore-tex rain jacket which has a grand total of none. The pockets are a decent size and would allow sufficient space for storage of items you may wish frequent access to. 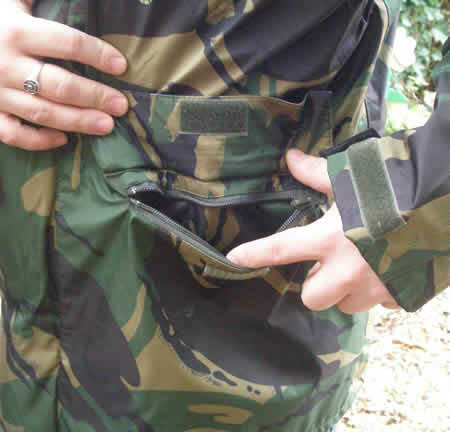 The combination of zip and storm flap ensures anything in these pockets will remain completely safe from any water - I tested this by storing a pack of cigarette papers in it and they remained bone dry and usable after a month of regular soakings. The seams are taped which is something inferior quality jackets often forget and is almost always where the claims of manufacturers about the jackets waterproofness falls down somewhat. Not so with this jacket - at no point has it experienced seam failure, much to my relief. It has a concealed hood in the collar which is easily deployed using only one hand whilst wearing the jacket without you either having to remove the jacket which defeats the purpose or having to do a strange and unique dance to get the hood out much to the amusement of other members of your group. The hood is adjustable which allows you to have it as tight or as loose as you desire or the weather conditions dictate. Another winning point for me over some other jackets as I wear glasses and these are as vulnerable if not more so than the rest of my face, other jackets have resulted in the hood being blown off in a huge gust and my vision reduced to cm's rather than feet and a desperate need for windscreen wipers became apparent. This Highlander Pro-Force Jacket also features adjustable cuffs and waist which allows you to completely seal out the possibility of rain getting in but also allows you to vent if the rain is not torrential which helps prevent chronic meltdown when wearing it. The cuffs being adjustable also work well in holding the sleeves up should you wish to roll them up for any reason. The two-way zip has a storm flap which means that you can zip it up and down as normal but also open it from the bottom should you need to vent a little warmth or access trouser pockets without having to open the jacket completely. The storm flap also protects the zip from becoming a weak point in the waterproofness of the jacket. Now a little info from the producers of the jacket regarding the material it is made from: it is manufactured from Ab-tex® which is a waterproof and breathable laminate which has been specifically developed for garments by manufacturers of outdoor pursuit clothing. Ab-tex® ensures a high level of waterproofing while maintaining an excellent breathability rating that will guarantee protection from most weather conditions. Ab-tex® fabric works by uniting molecules from various compounds to form a membrane that allows moisture to evaporate, at the same time acting as a superb barrier to the weather. Sounds impressive doesn't it. Basically it's a waterproof and breathable laminated material and the above claims are spot on. This jacket will eventually wet out but so will every material and if the weather is that bad you would be well advised to seek shelter no matter what jacket you were wearing in my humble opinion. This jacket weighed in at only 555 grams which is almost insignificant when carrying it in a day pack and is hardly noticeable when wearing it. It's light enough to carry as a back-up pretty much every day as personal insurance against being soaked. It's also light enough that you can layer up beneath it when the seasons have changed but the weather hasn't. This jacket is well priced, well thought out, fitted out with useful features and is one I will recommend to friends and family looking for a good quality rain jacket. You can buy the Waterproof Breathable Jacket directly from this site.